This photo was taken from Grand Haven, MI on the shore of Lake Michigan. There’s a power plant far in the distance spewing water vapor into the atmosphere. A long exposure made this look really apocalyptic to me, which is a fun exercise because this is in fact a beautiful beach and town. Hello fellow bloggers–I’ve entered into a photo contest in which the winner gets their photo featured in the Grand Haven Visitor Magazine. I would be grateful if you could take a look at the contest and vote for my photo, if you feel it is deserving. Click on the image below to vote. Thank you for your help! 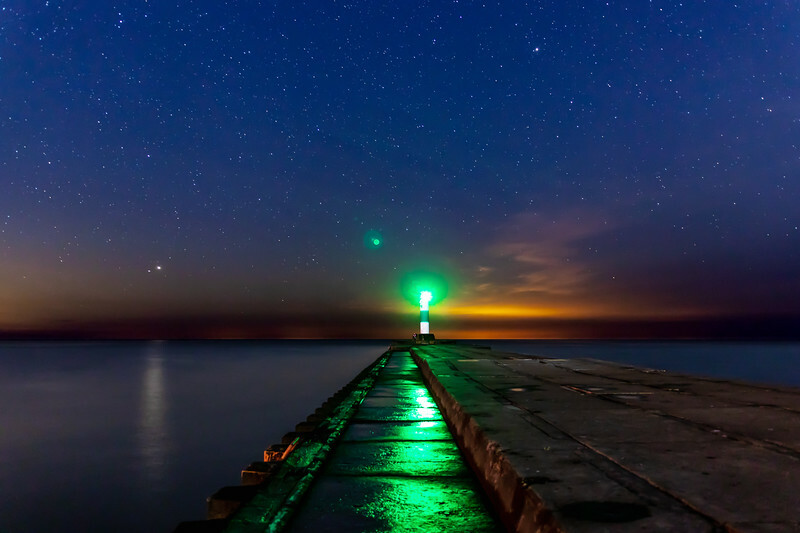 This is the Grand Haven pier beneath the Milky Way, taken in August. The bright object in the sky to the left of the lighthouse is Mars. The orange glow to the right emanating from the horizon is likely from Chicago (southwest of where this photo is taken).